고려 후기 문신인 염제신(1304∼1382)의 초상화로 가로 42.1㎝, 세로 53.7㎝이다. 염제신은 어릴적부터 원나라에서 살아 원나라 황제의 총애를 받기도 하였으며 고려에 돌아와 여러 왕들의 신임을 받으며 문하시중(門下侍中)까지 올랐다. 이 초상화는 머리에 평정건을 쓰고 오른쪽을 바라보는 모습으로 안면은 회색빛을 띠며, 눈썹과 모발, 수염은 흑·백의 가는 선을 이용하여 묘사하였다. 눈시울은 붉은색으로 명암을 넣었고, 눈꺼풀은 가는 먹선으로 처리한 후 속눈썹을 일일이 그렸다. 옷은 연보라색 바탕에 보라색 선으로 덩굴무늬가 그려져 있다. 이 초상화는 공민왕이 친히 그려 주었다고 전하나 확실하지는 않다. 고려시대 초상화인 안향의 초상화나 이제현의 초상화에서와 같은 형태의 구도와 화풍이 나타나며, 특히 옷에 그려진 덩굴무늬는 처음 보이는 것으로 섬세하게 잘 묘사되어 고려시대 초상화의 높은 수준을 보여주는 매우 귀한 작품으로 평가받고 있다. 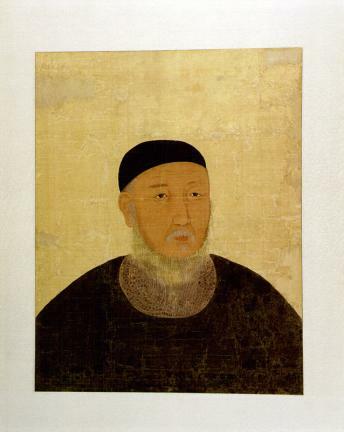 This is a portrait of Yeom Je-sin (1304-1382), a civil official of the late Goryeo Period. It measures 42.1 cm wide and 53.7 cm long. Yeom Je-sin lived during the Yuan Dynasty of China from his childhood, with the Yuan emperor favoring him. After returning to Goryeo, he served in various official posts during the reigns of several kings, finally becoming a chancellor. In the portrait, Yeom is wearing a black cap and looking to the right. His face is painted in gray color, with his hair, eyebrows, and mustache depicted with thin black and white lines. The light and shade of the edges of the eyelids are expressed with red color. The eyelashes are drawn separately without omission after portraying the eyelids with thick black ink lines. This portrait is said to have been painted by King Gongmin of Goryeo. The painting style and composition of this portrait are very similar to those of the portraits of Yi Je-hyeon and An Hyang. The scroll patterns on the clothes of Yeom are unique and are very elaborately depicted. It is regarded as a very valuable masterpiece for its rarity as a portrait of the Goryeo Dynasty and its artistic excellence, showing the high standard of the portraits of the Goryeo Dynasty.